General Motors has just released what is technically the third teaser of the 2014 Chevrolet Corvette with this newest video offering us a look at just a bit of the high tech gadgetry that will be found in the new C7 when it debuts on January 13th 2013 including a 200 mile per hour speedometer and a massive tachometer – both of which are located on a new digital readout cluster. This newest 2014 Chevrolet Corvette teaser video is entitled CALIBRATION and while the video refers to itself as the second, it is actually the third teaser clip issued by General Motors since they first announced that the next generation Corvette would debut at the 2013 North American International Auto Show in Detroit’s Cobo Hall. While this video offers even less detail than the first two diminutive clips showing the upcoming C7 Corvette, CALIBRATION offers us our first look at the new high tech digital gauge cluster that will adorn the dash of the newest American performance car. Like the first two videos, this third piece shows a bunch of fairly unrevealing shots followed by super quick glimpses of 2014 Corvette features with this 44 second spot showing items including the new gauge cluster, the rear suspension and a close up of a wheel that we can only assume will be offered on the C7. This new 2014 Chevrolet Corvette teaser video begins with a voiceover by GM Performance Integration Engineer Alex MacDonald proclaiming that “(the new Vette) is a new level of electronic integration”. He goes on to state that you do not feel like you are trying to drive to the car but rather, the car is doing what it is told. He ends his brief monologue with the statement “you’re just making the car right for the road you’re on – no compromises”. During this short video, while MacDonald offers his views on the 2014 Chevrolet Corvette, the video cuts from scenes of Alex at work, testing the new C7 Corvette along with some new tightly cropped shots of the new American supercar. For those who are impatient, we have taken the liberty of outlining when in this video we see new angles of the upcoming 7th generation Chevy Corvette. Just 2 seconds in, we get a look at a portion of a rim accompanied by a great many different tires, presumably a wheel option of the 2014 Chevrolet Corvette surrounded by the various tires used during the testing procedures. 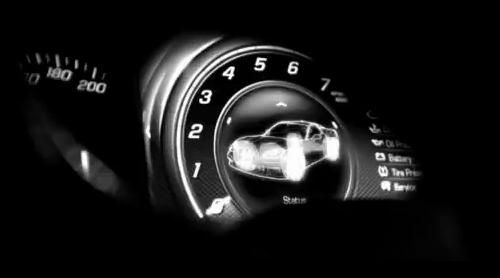 At 10 seconds, we get the most exciting shot of this video with our first look at the new gauge cluster featuring a digital readout (most likely TFT – thin film transistor) that offers a 200 mile per hour speedometer and a large centralize tachometer that runs up to 7,000 rpm. Inside of the large tachometer is the outline of the 2014 Corvette on some sort of “status” screen and at 11 seconds, we see a set of steering wheel mounted buttons that control the driver information panel located just to the right of the new digital tachometer. This area offers the driver a look at the workings of the new LT1 engine including engine temperature, oil temperature, oil pressure, battery levels, a tire pressure monitoring system line and the distance until the next required service. We would guess that this area will offer more information to the driver as well. 12 seconds into the video, we get a closely cropped shot of the new digital speedometer revving up to 6,500 rpm or so accompanied by the roar of the new C7 Corvette’s LT1 engine and 28 seconds in, we get a shot of the undercarriage of the C7 in action – showing the rear suspension at work on a twisty road course. The image above on the right shows a screen shot captured from this video of the new gauge cluster with the speedometer and tachometer. The newest 2014 Chevrolet Corvette teaser video ends with the proclamation that “Roads Will Surrender” followed by a reminder that the car will debut the night before the open of the 2013 Detroit Auto Show on 1-13-13. For those who have missed the first few 2014 Corvette teasers, we have included a small gallery showing the early shots of the C7 on the right side and you can view those images by clicking any of the thumbnails.